Blue print of the series "Il vuoto che mi hai lasciato", size 6x12cm on Bristol 10x12cm. 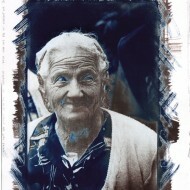 Cyanotypes have deep blacks on Bristol 350g, they are brilliant, detailed, highly contrasted. The color is a pleasant deep blue, almost violet. The loss of the image during the washing is minimum, therefore the effect of granularity is much contained. 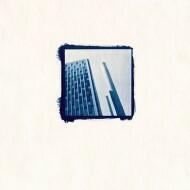 During last weekend I personally tested several types of paper to print in cyanotype. The paper must satisfy all the following exigencies. It must produce deep and almost black blues, not pale or washed-out light-blues. This is essential to get brilliant and bright blue prints, which would be consequently rather flat. It must have a satin surface; as I’m contact printing 6×12 negatives, fine details become absolutely fundamental. It must have an important weight to ensure flatness after coating. Papers whom embark too much, even if bone dry, gets the adherence with the negative hardly. On a textured paper can also not be a problem, but on a satin surface sudden appear unpleasant blurred spots. The image does not have to fade during rinsing. 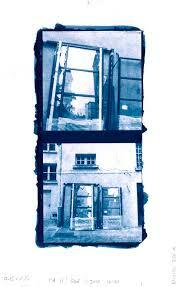 Cyanotypes normally loose density during this phase. Some types of paper though release some filaments of blue during the first minutes of washing. This generally produces a granular and irregular aspect, it makes necessary longer exposition and commonly generate less fine images. It must be cheap. I’m very annoyed by watercolor paper that costs 5euros per sheet. Naturally I have to like it. It must have a pleasant surface and consistence, but most of all produce the right print. This last point is highly subjective and personal. I printed on Gerstaecker Watercolor (orrible paper, excellent blues), Fabriano Artistico, Canson, Arches Platine, White Nights, COT-32. They all present a strong loss of image during first wash. Two kinds of paper that do not present this problem are Shoeller Durex 250g and an Arche paper which I do not know the precise name. Water doesn’t get dirty even after many washes and the image nearly weaken. The problem is that Schoeller embark with dishonor and Arche is too much textured. I went buying some sheets of paper. The requisite of price and surface brought me to technical paper: C grain 224g, Lavis Technique 250g, Lavis Vinci 300g, Montval 300g, Miner Multitecnica 400g, Bristol Extra Vinci 350g. Prices go from 1,20 and 2 euros per sheet sized 50x65cm. Some of them are the most textured. The test is not so strict, no Stouffer palette and no control to stop all the variables. I simply took 3 or 4 negatives and tried to obtain good prints. UV exposition varies from print to print and surely playing with time can amplify or reduce differences. The other variables are more or less fixed: 0.1ml+0.1ml in one coating of “classical” solution on a surface 6,4×12,4 cm. As the paper is no more brilliant, I use a drier to eliminate any trace of moisture. UV exposition and 3 washing soaks of 1, 3 and 5 minute each. The first two are prepared with 1 liter of water and 1 ml of 80% of acetic acid, the last one with pure water. All of the papers loose density. The effect is more or less prominent, but it could depend from different expositions. Normally the Miner Multitecnica is the one that mostly suffer this problem and that has the most granular print. However, 30×40 cm is an extremely nice print, even if it’s absolutely to discard for the little contact prints on which I’m working. All of the papers print a deep, lightly violet blue, which I do found pleasant related to the classical saturated and brilliant blue of the cyanotypes. Montval is the exception, as it has a completely different color: it is a cyan more similar to aqua green. All those papers, because of the high weight, are absolutely flat and stable. A pleasure compared to Shoeller. They’re all satin, even if they go from the smoothest to the fine grain. Bristol 350g is the smoothest at all. This last one is contrasted more than any other. 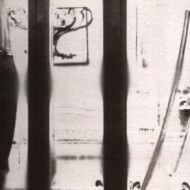 Having a smoother paper can be useful printing analogical negatives, as it allows printing negatives too hard for cyanotype. A contrasted paper is maybe more performing with digital negatives. I will verify this hypothesis as soon as I can. All things considered, Bristol 350g seems to be the satin paper more indicated to cyanotype print, mixing an enjoyable color, deep blues, a perfectly smooth and detailed surface, scarce loss during washing with a light granular effect. If we add the perfect dimensional stability, the high contrast (that could be useful to digital negatives too) and the fact that is one of the cheapest I tried, it’s easy understand that it will be my reference paper. Perhaps it got ‘lost in translation’ but I don’t know what the author means by Bristol 350g. To my knowledge bristol is not a brand but a type of paper made by several comnpanies. You are right. The Bristol 350g I used is produced by Canson: It was quite easy to find in Paris, hope you can get it in your country!